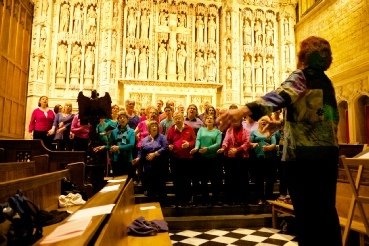 VocalAntics Community Choir, Cheltenham, started in September 2002. A warm, friendly group which now numbers around 60 enthusiastic members. Our main focus is on singing for the sheer pleasure of it, but we also enjoy the opportunity to perform at local community events. The emphasis is on the sheer joy and diversity of singing, rather than following any particular musical style. The only requisite is an open heart and a desire to sing. The choir members learn all their songs by ear without the use of written music, so they find they rely on each other to learn the parts together. 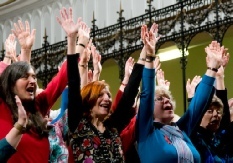 This creates a real sense of community within the choir as a whole and within the individual parts in particular, as a result individuals quickly build real friendships. The choir has built up a healthy repertoire of songs from across the world in a wide variety of styles.